The Hyperledger meetup scene continues to thrive in 2017. We now have 9,134 members across 38 different meetup groups all around the world! We have our amazing community to thank for this growth. Most recently, we hosted a meetup in Seoul, South Korea. 50 people attended from financial institutions like Mirae Asset and Shinyoung Securities, universities including Korea, Yonsei, and Hongik, as well as Hyperledger members like Coinplug, Samsung SDS and Koscom. There were also a few startups in attendance. The content was introductory and focused on Hyperledger Fabric. We’re now planning a meetup in Seoul on February 23 that will cover more general blockchain information, key players, as well as additional information on how Hyperledger fits into the market. On January 17 we held our second Hyperledger Hong Kong meetup. 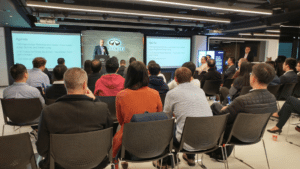 Around 50 people attended, from financial institutions such as HSBC, Bloomberg and Standard Chartered Bank, to consultants including Ernst & Young and Deloitte, and Fintechs like ANX International. Attendees were updated on exciting developments and activities in Hyperledger in Asia Pacific and Greater China, by Hyperledger Asia Pacific VP, Julian Gordon, and for Hong Kong by IBM’s Solution Industry Executive, Daniel Leung. John Wolpert, IBM’s Blockchain Offerings Director, led an in-depth discussion and Q&A on Hyperledger Fabric. The meetup was organized by Jen Advisors and held at Infiniti Lab. We also hosted a Hyperledger meetup in Shenzhen, China on January 7. 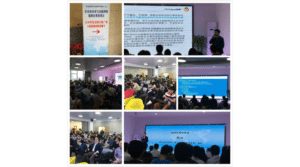 The meetup was organized by IPA (Investment and Promotion Administration, Futian District), FISCO (Financial Blockchain Shenzhen Consortium), Energy Blockchain Labs, IBM and Huawei. More than 250 attendees from 40+ different organizations came to sit in on both morning and afternoon sessions that covered the basics of blockchain technology, its application in financial services and technical discussions on Hyperledger. Finally, there is a Hyperledger Hackathon planned for March 10 & 11th in Shanghai. It will include an overview on Hyperledger, chaincode development, and blockchain use case discussion. If you have any other questions about starting a meetup or the process, please email meetup@hyperledger.org.